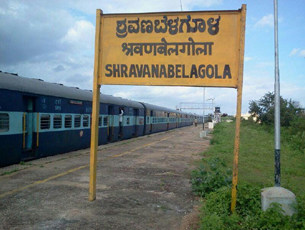 Mangaluru, May 28, 2017: With the opening up of Shravanabelagola line, services of train 16515/16516 Yeswantpur-Karwar-Yeswantpur tri-weekly express has been diverted from Tumakuru-Arsikere section to Nelamangala-Shravanabelagola section. Accordingly, service of train 16575/16576 Yeswantpur-Mangaluru Junction-Yeswantpur tri-weekly Gomateshwara express and that of train 16515/16516 Yeswantpur-Karwar-Yeswantpur tri-weekly express will run on alternate days on same track and on same timings as given below. Accordingly, train 16515/16575 will leave Yeswantpur at 7.10am, Chiknanavar at 7.21am, Nelamangala at 8.25am; Kunigal at 8.39am; B G Nagar at 8.56am; Shravanabelagola at 9.30am; Channarayapatna at 9.41am; Hassan at 10.35am; Sakleshpur at 11.40am; Subramanya Road at 2.30pm; Kabakaputtur at 3.20pm; Bantwal at 3.52pm and reach Mangaluru junction at 5.30pm. The services of train 16515 will arrive at Mangaluru Junction at 5.40pm and leave the station at 6pm. There will be no change in timings for train 16515 in Mangaluru Junction and Karwar section and for train 16516 in Karwar-Mangaluru junction section.